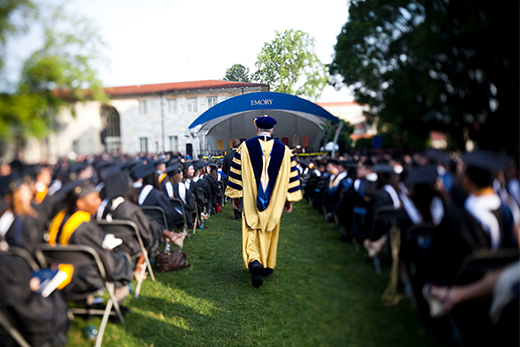 During 2014 Emory University built on three core values that have particular resonance for our community: excellence, integrity and optimism. Excellence: From the Lasker Award to Guggenheim fellowships, Emory faculty members have garnered major recognition for contributions in research and teaching, while Emory students have won national championships and earned prizes in entrepreneurship and creativity. Accolades such as these are evidence of a deeper meaning of creative excellence that leads and transforms. Integrity: Meaning wholeness as well as principled action, integrity sums up Emory’s commitment to being a UNI-versity, whose parts work collaboratively toward a shared mission, understanding our purpose and being committed and focused on it. Optimism: From the successful treatment of patients with Ebola virus disease to the determination to forge new ways to combat sexual violence, our faculty, students and staff aim to bring hope to the world. We do that with confidence. Who better to embrace bold aspirations and square off against challenging problems than the researchers, teachers, students and alumni of Emory? To learn more about Emory’s vision, and how you contribute to it, read the report and see the State of the University video at emory.edu/annualreport2014.